Ross’s motorised Swan so realistic he thought that the real swans at Over might be upset! 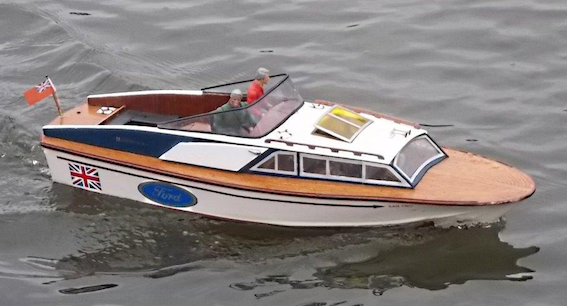 David E’s “The Lanchester Boat “built by the Lanchester Brothers to test and develop a motor engine for a future car and they incidentally built the first ever british Motor Boat,with a british built engine. 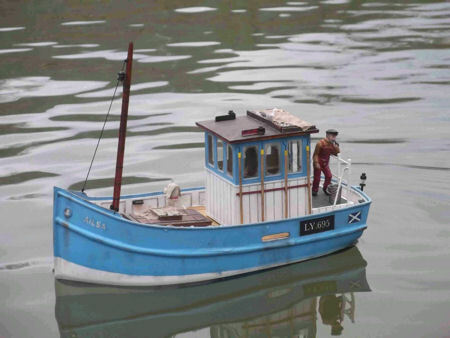 Another absolutely beautiful miniature model built by Armando from the Model Slipway kit. LOA is less than one foot (1/72 scale); Mtroniks 10A mini ESC, micro-servo, Cirrus receiver, custom 7.2V pack driving a small CD-type motor; the small figures are from a Preiser ‘Railway Workers’ set, but modified and repainted; the wheelhouse (removable for access to the servo/tiller) is half-clad with veneer planks; the decks are planked using individual veneer planks; the cargo area is scratch built and is removable for access to the battery/motor; named ‘Clansman’, the lettering is from the BECC self-adhesive range. 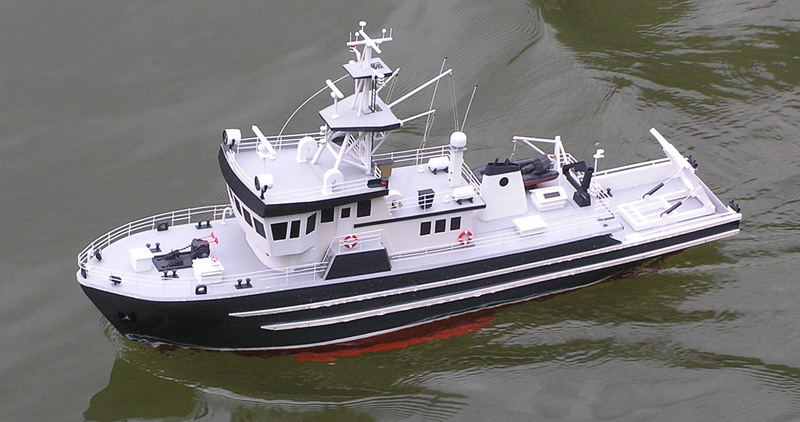 Yet another beautiful boat from Armando.’Ailsa’ is a footy-type fishing boat (approximately 1/24, G-scale) based on a vac-form hull from George Turner Models (GTM). The cabin was scratchbuilt from plasticard (veneered with planks), acetate sheet and ply. The plasticard deck was covered with individual planks. The lighting system runs from a spare receiver channel, via a modified servo Y-lead (with switch incorporated) and consists of navigation lamps, an interior cabin light, a mast lamp and a rear deck light on the transom. The two Graupner figures have been repainted (and weathered!). The boat has been well-weathered to depict a hard-life at sea, and includes dirty/cracked windows, and a salt-covering of most surfaces. Two buckets of fish and four trays of fish (GTM accessories) were modified by covering with weathered/stained rags (actually dilute-PVA covered toilet paper, painted) and the seagull positioned eating the fish. Other deck clutter was scratchbuilt. The motor was salvaged from a VHS player – a small unit rated at 24V (used for loading/unloading tapes) and so is relatively low-revving at only 7.2V (scale speed achieved on full throttle), and is coupled to a short Graupner pro-shaft (via a piece of silicone tubing) and a 29mm 3-blade prop. A 10A M-Troniks ESC is used together with a Cirrus micro r/x (the aerial runs under the deck) and a micro-servo linked to the scratchbuilt rudder Here we have Phil’s new Borkum steam launch fitted out with an Anton steam engine.and tiller. Here we have Phil’s new Borkum steam launch fitted out with an Anton steam engine. 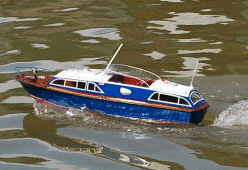 Above is Peter & Barbara’s leisure narrow-boat. it is from made from a Riverside Models kit and comes as a fibreglass hull and flat pack wood, all marked ready to cut-out. ( takes patience) A Graupner speed 400, with 2:1 reduction gear, 4″ shaft & 37.5 3 blade prop is used to power the craft. Barbara did the internal fittings that includes working lights. Construction took about 150 hours to complete. 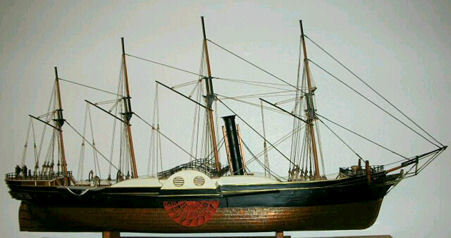 Mount Fleet Model Steam Drifter. Owner Peter B. 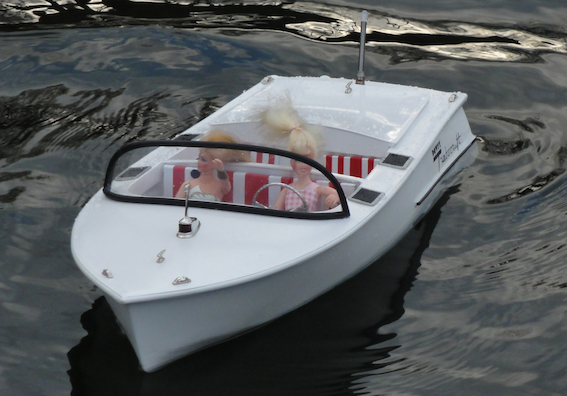 Here we have Bob P’s new narrow-boat, sailing at Over. 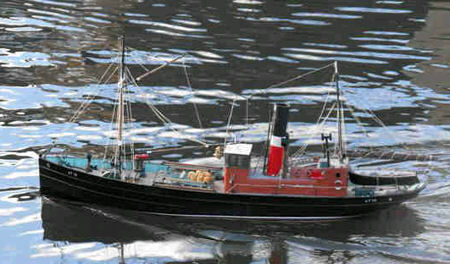 It is made from a Waverley Models Hull. A Nice example of a fishing boat just setting out for another bountiful catch..we hope! Under the watchful eye’s of Captain Pete P.
Two views of Barrie’s buoy layer, Vliestroom, this is a kit from Model Slipway that took two years to build and needs two to launch it. Views of Bob’s Great Western built from Science Museum plans used to make their model many years ago. Some parts (notably the fore and aft decks) have been remodelled in accordance with the model on display in the Bristol Industrial Museum which are probably those of a later refit. 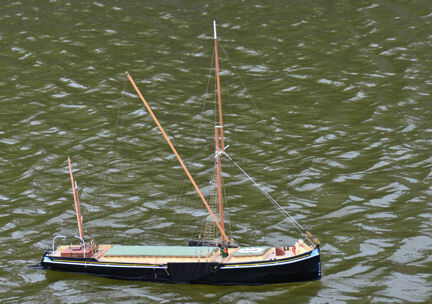 When the model was first built about 15 years ago it had full working radio control of independent paddle drives using Pile motors and toothed-belt drives. In the interests of preserving the model these have been taken out and the model is for static display only. 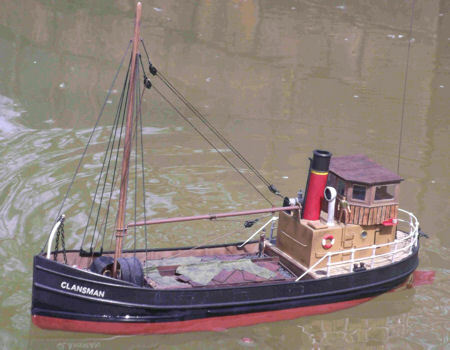 It has been exhibited on several occasions at celebrations of Brunel’s three great ships and we do not know of any other models (except those in the museums mentioned above and, of course, the classic Airfix kit) of this ship. Does anybody else have one? 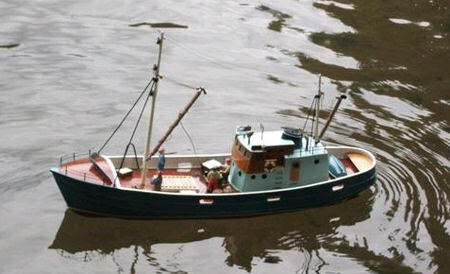 Alan’s (much adapted) Artisenia Latina kit of a sail/power trawler ‘HELLEN’. It is built to 1/20th scale with full lighting, ‘action electronics’ including speed controller, switching and engine sound simulator. He has a trusty RC laser for use on windy days but takes this out when he is becalmed. This is his first marine model for 50 years and took him 2 years on and off to complete it. 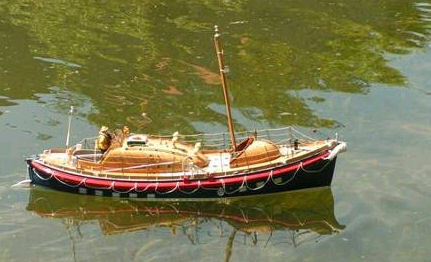 Ted’s Model Slipway kit of the Watson class lifeboat named John Gladys Tedaldi in memory of his parents.